Not many bands can say they gave a genre its name, but that is more or less what New Grass Revival did. Though they have gone through many incarnations and are most known for helping to launch perhaps the most famous banjo player in the world, Bela Fleck, it is their earlier albums that I truly enjoy. 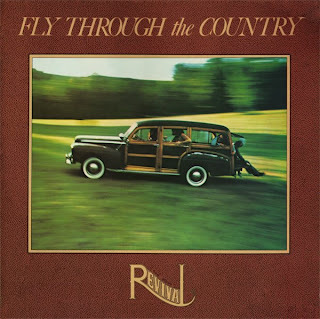 Fly Through The Country and is that 70s bluegrass (or "new grass") sound that was made somewhat popular by them and fellow bands like The Seldom Scene and Hot Rize. It is pretty traditional sounding and not breathtakingly fast, but remains solid the whole way through. The album is a great combination of instrumental prowess, slower romantic songs, and great harmonizing. It can be almost cheesy at first, but repeated listens reveal small revelations about how the musicians use their instruments to truly frame the vocal parts. It sounds natural, and though the sound is clean, it doesn't sound like their is too much studio trickery on the album. You seen those old-timey bluegrass guys on the corner of the market having a good time? That sound stems from New Grass Revival, and for anyone remotely interested in the modern bluegrass sound, this is a great place to start.